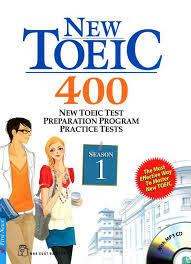 New Toeic 400 Season 1. Get Best TOEIC Preparation Materials and Practice Book for Reading, Writing, Listening, and Speaking. Get TOEIC Materials , Tips, Tricks. Practice more and boost your score. Since the end of the month 5/2010, New TOEIC begin introducing English-speaking section is the main point of this revision through the given situations and conditions the actual language used in the test. New book TOEIC 400 – Season 1 update lessons and exercises according to the latest sample exam questions, and remain difficult and the basic skills such as old exam format, makes it easy to exercise possibilities listening-speaking-reading-writing effectively, achieve the highest results in real exams. More TOEIC Materials, Dictionary, and Vocabulary Books also GRE and GMAT Preparation Materials. Join Our Facebook Group or , Google+ and Get PDF Book, Audio CD, Full Practice Materials and Free TOEIC Practice Test. DxSchool is the best choice of the Students from different Platform For Free Information and Resources Download. Ask for any materials you need for your Test Preparation. You will get all Books and Materials in our Forum. i don’t understand how can i download materials. help me please. Please help to give me the link to download the file! Thank you!